Glenn Irwin on the Ducati Panigale in practice at the North West 200. 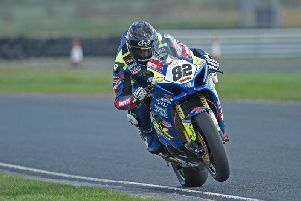 Glenn Irwin has only managed 11 laps in practice on the PBM Be Wiser Ducati, but the British Superbike protagonist will line up on the front row of the grid at the Vauxhall International North West 200 on Saturday. Irwin acknowledges that he faces a massive challenge if he’s to come out on top, but he is a rider in red-hot form coming off the back of some terrific rostrum results in BSB.